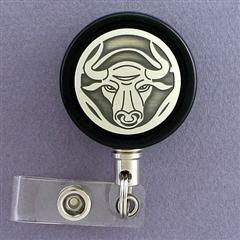 I need a Bull Retractable ID Badge Holder with Steel Cord to replace my almost broken retractable badge holder. The stupid cheap badge holders have a tiny braided thread that doesn’t stand up to being used on a regular basis. Since I have to wear an ID/Access badge at my work all the time, it would be nice to have something that would withstand being used daily. This entry was posted in General and tagged ID badge holder, steel cord, Work Life on 2008/07/28 by Jeff Ivany.